As we leave the now just two platformed Lowestoft station, we pass lots of empty sidings on the left. On the right is Oulton Broad. The 2 car Sprinter I am in is quite noisy, as the Ipswich line pulls off on the left and we come into Oulton Broad North station. There are about thirty passengers waiting to get on. The station is well maintained with a couple of shelters on each platform and the original station building is still intact. We go over a level crossing and then it will be non-stop all the way to Norwich. We soon speed up to about 60 mph as we cross flat wide open scrub land. 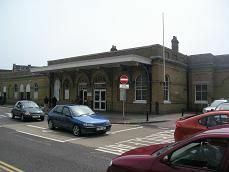 Somerleyton station, situated in the middle of the broad is a nice country station with two platforms and is well kept. Soon after we cross the river Wayveny on the Somerleyton swing bridge as we continue across the broad. There is a windmill on the right. The line is not welded here, so there is a constant clickety clack. Haddiscoe station is next and is another isolated country station, with the original station house. We then run parallel to the river Wayveny and see the occasional pleasure boat cruising along, passing a group of swans. There are more windmills in the distance. We slow down and come to a standstill as the track veers sharply to the right as we approach Reedham Swing Bridge. We then come back onto double track as we join up with the single branch line from Great Yarmouth. We speed up as we go through Reedham station. The main station building is closed off on the up line, but there is a pleasant enough station on the down line. It is still very rustic here with lots of cows grazing in the fields beyond the station. There is a large sugar beet factory on the left, which gives out a strong, pungent smell. Cantley station is small with a red brick station building and as usual well kept. We go through more marshland and then arrive at Buckenham station, which again is in the middle of nowhere, passing through it at about 50 mph. The other line from Great Yarmouth joins us on the right just before Brundall station, which is quite a big station with its original Victorian station house. There are plenty of boats to be seen here in the boatyard on the left. We then pass lakes on the right and come into Brundall Gardens station, which has a wooden waiting place. We are now doing about 60 mph. We go under the A47 and then slow down, coming to a complete stop, presumably to let a train through ahead on the Sherringham line. We then join up with the Sherringham line and then cross over the river and see a pub full of customers watching our train from the pub's garden. We go past Crown Point carriage sheds and join up with the Great Eastern main line from London and come into Norwich station on time. The train is about ¾ full.